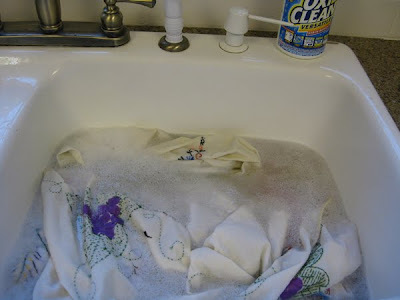 I've been washing things at the kitchen sink-not dishes but linens. Usually I do laundry on Sunday. 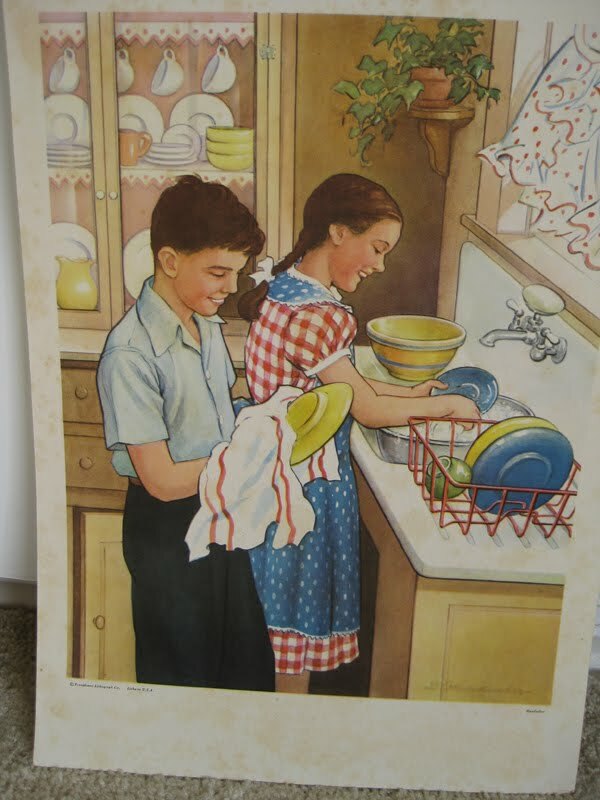 But today I'm washing vintage linens in Biz and Oxyclean. I've read about this on other blogs and it really does work. Last Friday my good friend and I visited a small town north of Gainsville called Whitesboro. Sorry I didn't take any pictures.It has a tiny main street and not too much there except a wonderful scrapbook store, quilt store. and 2 antique stores. We also hit an estate sale. I ended up buying mostly linens. Then I came home and tried the soaking technique and it works! Some of the towels below had brown stains on them and after soaking I can't see any on there. Now I want to go into my stash and see if I can get them all clean. It does take awhile but persistence pays off! Next I need to iron-haven't gotten to that yet. For some reason when I'm washing old linens or washing old dishes by hand it's kind of fun. 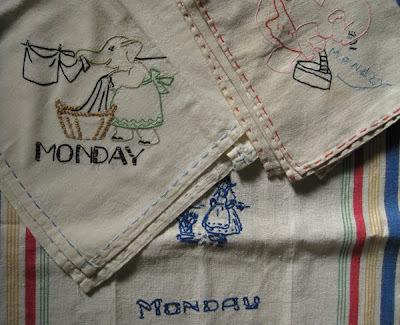 I would never say that on new stuff, but you kind of appreciate handling the vintage things. Anyway below is a nice piece of fabric that will soon become a tablecloth. I even got the yellow napkins at the same estate sale. 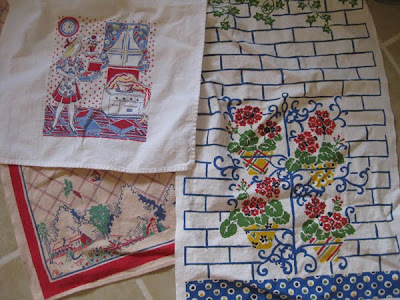 Off to the kitchen sink and than onward to the ironing board! I need to get a life! The first pic is from an old book-it's quite large about 12' by 20'. Bought it at one of the antique stores. Couldn't pass it up-the colors are perfect for my kitchen and I love that sink! Getting ready to send my Graduate off to Europe tomorrow-many last minute details to take care of for him. Thanks so much for the tip. I will have to try this!! I want to try that soak too, but haven't been able to find Biz! 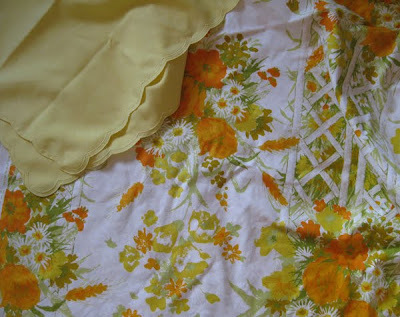 And although I hate ironing, it's pretty enjoyable to iron some great vintage linens like the ones you found! Lelie..drop me a note on email your graduates name so I can put him on my prayer list!! LOOOOVEEE the kids at the sink!! !That brings back memories!! I love your linens, you find the best stuff! And thanks so much for the cleaning tip. Wow, Biz! I had forgotten all about it. I can remember my mother soaking my dad's golf clothes in it when I was young and saying what a miracle worker it was. P.S. forgot to say I think your print is charming, love it! P.S.S. My brain is moving faster than my fingers or perhaps it's vice versa?! Wishing your son a wonderful trip to Europe. My oldest niece went with her class but her younger sister opted not to because her friends weren't going - I so wanted to encourage her to go anyway. Time passes so quickly and there may never be another chance. I love the days of the week linens! I remember mom had those when I was a kid. I loved them. I think my great-grandma made them. She loved to crochet and do needlework!